Magic Pest and Lawn helps with Oxalis control in lawns and gardens to keep your Austin property green and free of unwanted weeds! 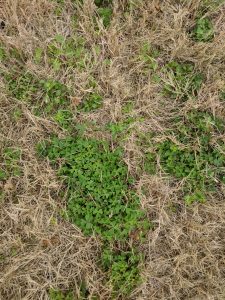 If you spot a clover-like plant in your Austin lawn or garden, you may need Magic Pest and Lawn’s yellow wood sorrel control services before this weed takes over your foliage. Yellow wood sorrel, also known by its scientific name, oxalis stricta or common yellow oxalis, is a common weed problem in the Austin area because it grows year-round and thrives in warm or mild climates. There are additional types of oxalis weeds, such as Redwood Sorrel, Silver Shamrock, and Ordinary Woodsorrel, however, all of these types of weeds can treated similarly. Magic Pest and Lawn’s weed prevention team is your wood sorrel control experts, and imperative to managing this hardy and fast-growing weed. Yellow wood sorrel is quite commonly mistaken for clover (see below) because its clover-like compound three-petaled leaves. Yellow wood sorrel actually is closer to the traditional “shamrock” shape, with heart-shaped leaves that have a crease down the center. When in full bloom, common yellow oxalis produces a yellow flower with 5 petals. Wood sorrel is found in dense patches on open areas of lawns and gardens and has a complex root system that makes it difficult to get rid of sorrel simply by pulling the weeds. Yellow wood sorrel, or common yellow oxalis, is very commonly mistaken for clover. However, these are two completely different weed species. Yellow wood sorrel has a compound, three-petaled leaf shape, much like clover. However, the leaves of the Oxalis plant are heart-shaped, while clover has oval-shaped leaves with a textured appearance. The easiest, most obvious way to tell these weeds apart are by their flowers: Yellow wood sorrel has a yellow, 5-petaled flower, while white clover or strawberry/red clover has a white or pinkish-red flower that is shaped more like an umbrella or Christmas tree light. As previously mentioned, the complex root system of the oxalis plants make getting rid of sorrel much more difficult than simply pulling the weeds. Magic Pest and Lawn uses a non-toxic yellow woodsorrel control herbicide or weed spray that can get to the root of your weed problem– no pun intended! Wood sorrel spreads quickly, with seed pods that have the potential to hold up to 5,000 seeds, with the possibility of seeds traveling up to 10 feet. This makes it easy for yellow wood sorrel to completely dominate your lawn or garden in no time without proper pre-emergent oxalis prevention. Yellow oxalis germinates from late summer to early fall, and if not contained quickly, it can become a headache for you and your Austin lawns and gardens. While the yellow flowers may seem pretty, they are certainly not harmless for your existing plants and turfgrass. Contact Magic Pest and Lawn’s weed control and prevention team for yellow wood sorrel control in Austin today!